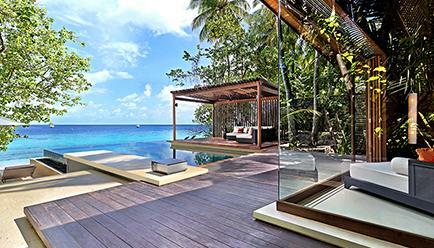 Relish at 3/4 nights of aquatic bliss while on a romantic getaway at Park Hyatt Maldives Hadahaa. 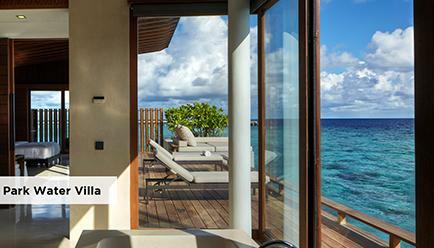 With mind-blowing settings for snorkelling, kayaking and culinary experiences for a Maldivian Feast, Park Hyatt Maldives Hadahaa adds value to your stay to make it even more cherishable than planned. 3 Nights Park Villa- 165 sq.m. 3 Nights Park Pool Villa- 180 sq.m. 3 Nights Deluxe Park Pool Villa- 265 sq.m. 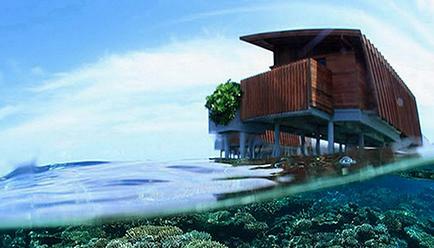 3 Nights Park Water Villa- 115 sq.m. 4 Nights Park Villa- 165 sq.m. 4 Nights Park Pool Villa- 180 sq.m. 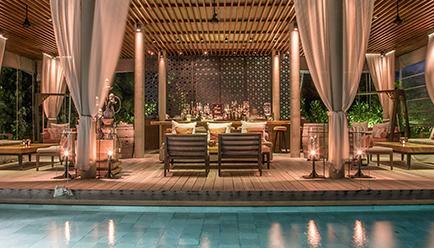 4 Nights Deluxe Park Pool Villa- 265 sq.m. 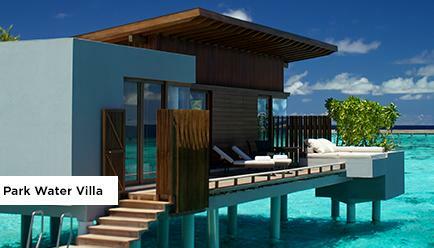 4 Nights Park Water Villa- 115 sq.m. 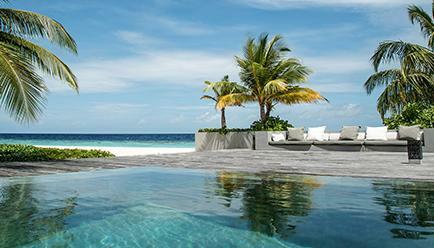 When at Park Hyatt Maldives Hadahaa, lay back with your loved ones at your private plunge pool or go snorkelling at the crystal blue lagoon- steps away from your villa. 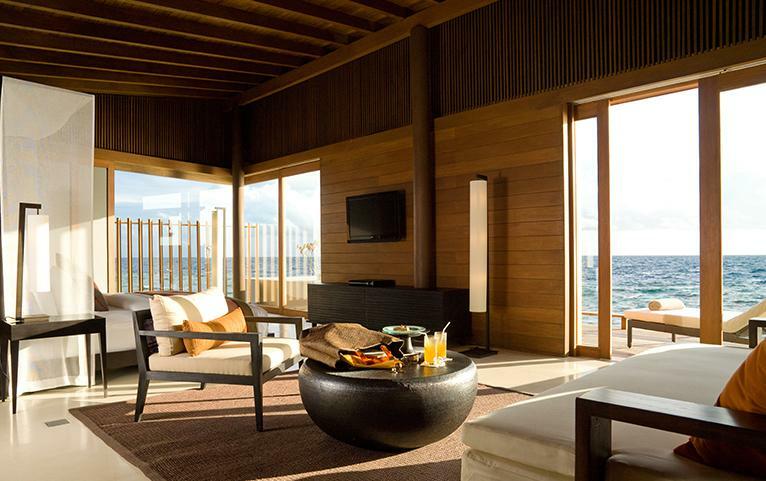 Try your hands on preparing a Maldivian feast while the best chefs are there to assist you. 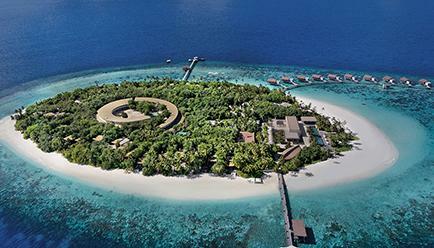 For the ultimate Maldivian getaway Park Hyatt Maldives Hadahaa is the place you can bank on. An archipelagic nation situated amidst the Indian Ocean, Maldives shares no counterpart in the entire world when it comes to its unique geography and topography. 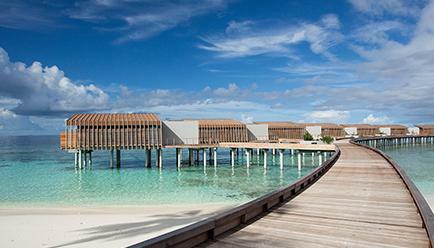 The sovereign nation boasts of its 26 natural atolls consisting of dual island chains. 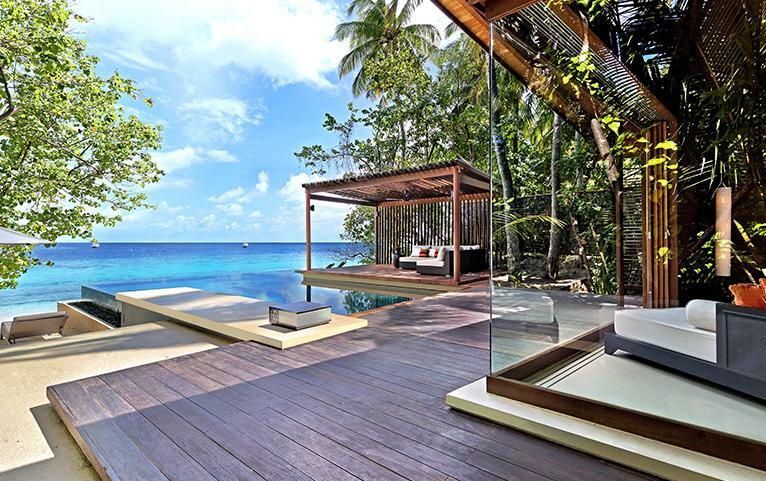 Located atop an underwater mountain range, Maldives has around 1190 islands and sandbanks. 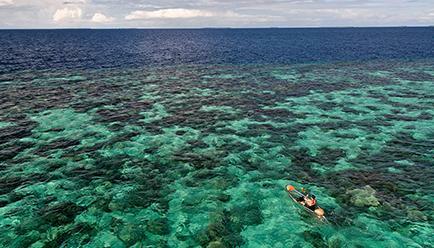 The doppelganger of pearl strings, these islands cover a land area of around 298 sq. Km. 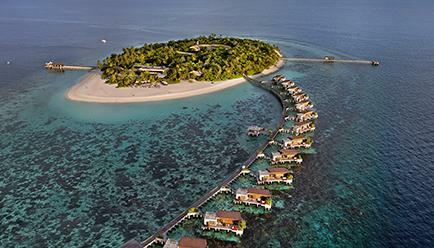 These islands are fenced by a lagoon with crystalline water and are protected by a reef structure, serving home to one of the most exotic and magnificent underwater life. Huvadhu of the Maldives makes the largest atoll in the world; larger than the Ontong Java Atoll and the Lihou Reef in the Pacific area. 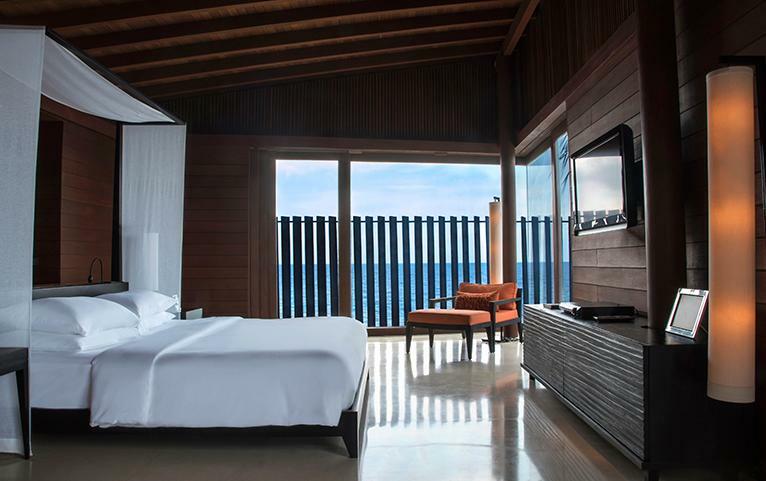 Located in the district of Northern Huvadhu atoll is Park Hyatt Maldives Hadahaa. 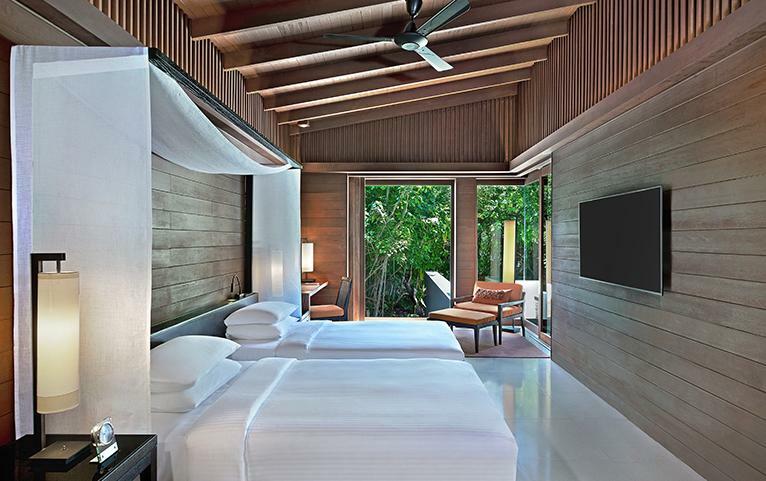 This retreat is a haven with a natural white beach, azure lagoon, 360-degree house reef steps away from each villa. 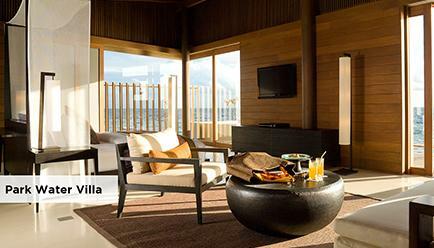 An ideal destination amidst the serene island, the hotel features cosy, comfortable private villas that are the ultimate choice for a memorable vacation with your loved ones. 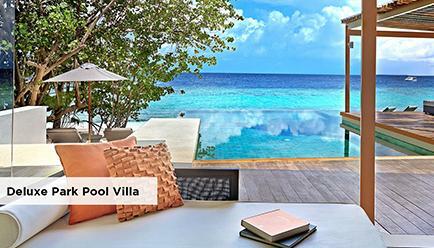 Nestled within the island’s tropical greenery or elevated above the water, the villas are steps away from an idyllic beachfront, providing guests direct access to the area or the house reef. 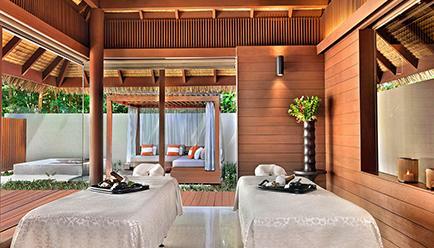 The luxe resort features fifty villas out of which thirty-six are on land and fourteen are over the ocean. These spaces feature floor to ceiling windows and doors that guide you to a private deck. 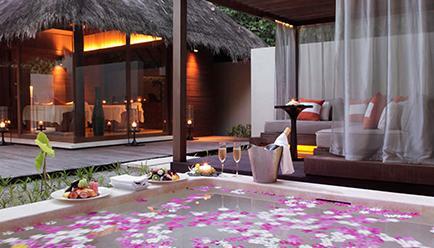 Few villas in the resort come with a private plunge pool too. Your dining experience is all set to get enhanced with the numerous dining arrangements at the resort. 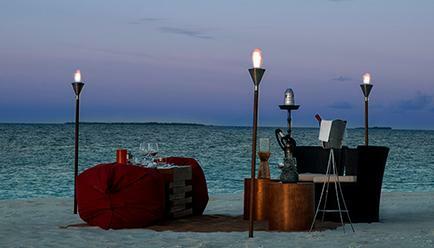 From traditional Maldivian cuisines to Chinese, Thai & Italian delicacies, from traditional architectural marvels to private dining, clubbing and Hadahaa meal plans- you get it all at the in-house restaurants and bars. 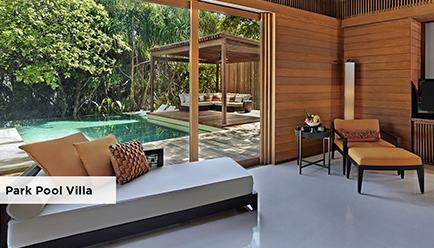 Park Villa: The 165 sqm villas feature a king bed with chaise lounge, private deck with table and chairs, sunbeds, indoor and outdoor shower area with terrazzo bathtub and rain shower area with direct beach access. 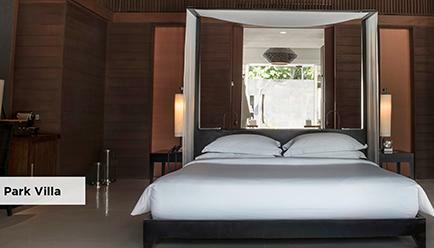 Park Pool Villa: The 180 sqm villas are fitted with a king bed, chaise lounge overlooking a private plunge pool and deck, indoor and outdoor shower area with terrazzo bathtub and rain shower area with direct beach access. 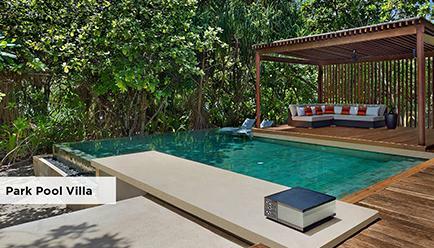 Deluxe Park Pool Villa: Relax in the 265 sqm villa featuring a large pool with semi-submerged sun beds, outdoor bale/cabana, a king size bed and a private outdoor terrazzo bathtub and rain shower area. 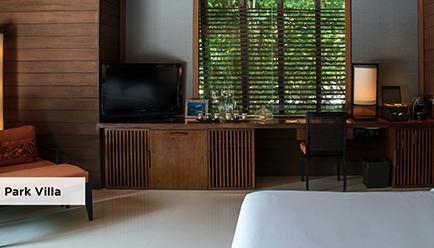 Park Water Villa: Unwind in the 115 sqm water villas with 180° views of the ocean, features a king bed, indoor bathtub, sun deck with daybed and direct access to the house reef. 7-day Change of Heart Refund Policy: We always have one deal better than the other. So we understand your change of heart. Within seven days of purchase, we’ll happily give you an option to cancel your booking, with a full refund, as long as the cancellation date is at least 30 days prior to the arrival date. For cancellations after seven days of purchase, the hotel’s cancellation policy and penalty apply. Hotel Cancellation Policy: Any cancellation within 30 days of arrival will incur a 100% payment. A no-show on the day of arrival will incur charges equivalent to a full stay. Maximum Guest Capacity: The maximum room capacity is two adults and one child (aged below 12 years). See the ‘Extra Guest Policy’ and ‘Child Policy’ for more details. Child Policy: One child (under 2 years) stays free of charge when using existing beds. One child (aged between 2 to 12 years) is charged USD 185 per night with an extra bed. For Domestic flight and speedboat transfer, the surcharge is US$ 344 per child for roundtrip. Extra Guest Policy: No extra adult is allowed. 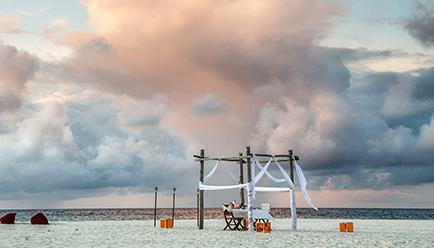 For the private beach dinner, a 24-hour notice for reservations is required. Airport Transfers: Speedboat transfers between the airport and the resort is provided. Ensure that you share your flight details and arrival time with the hotel so that they can serve you efficiently. 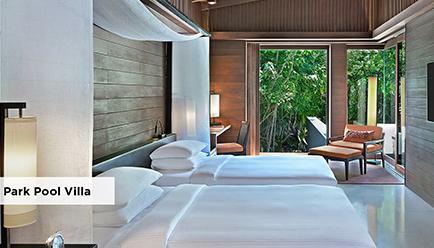 Hyatt e-concierge: Personalize your stay with Hyatt e-concierge and travel hassle-free. From scheduling your transfers to added facilities in your room- everything will be taken care of. 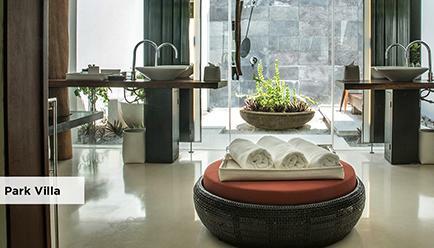 Vidhun Spa: Indulge in serenity with Vidhun Spa at Park Hyatt Maldives Hadahaa, where natural ingredients are used to provide a healing experience for your mind and body. Dining: The Dining Room and The Island Grill offer international and regionally inspired dishes in sophisticated yet casual settings. Meanwhile, the contemporary poolside bar and the unique Dhoni are great places to sit back, unwind and enjoy a refreshing drink. For special occasions, there are a variety of private dining experiences, including Lagoon, Starlight and Shoreline, each showcasing a unique aspect of the island. In-villa dining is available at any time. Fitness Centre: Keep up with your fitness regime with the 24-hour access fitness centre, equipped with cardio and weight training equipment. 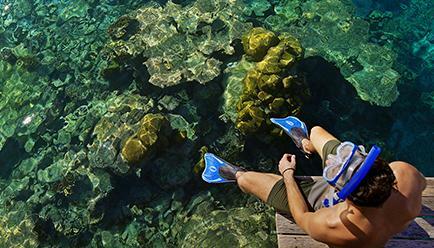 Snorkelling: Explore the crystal blue lagoon - just steps from your villa lies a mesmerising and vast coral reef with diverse marine life. Chance upon turtles, black tip reef sharks, spotted eagle rays, lion fish, parrot fish, clown fish and more, that makes Hadahaa their home. The Maldives is well connected to all the metro cities with an International airport in India. 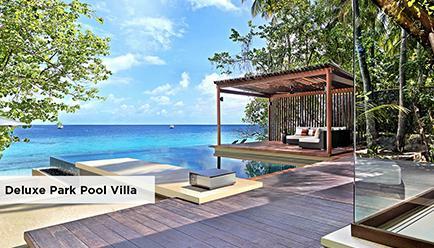 The resort is approximately 400 Kilometres from Male International Airport (also known as Velana International Airport). One can board a domestic flight from Male International Airport to Kooddoo Airport. From Kooddoo Airport, it takes approximately 40-50 minutes to reach the property by a speedboat. (Domestic flight tickets and speedboat transfers are a part of inclusion).